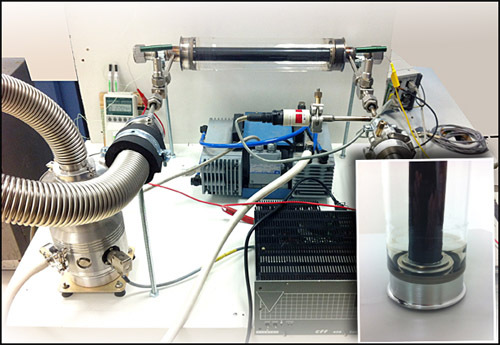 – System powered by thermal solar concentrators with vacuum evacuated solar receivers. This environmentally friendly solution uses free energy from the sun tu fulfil building needs : air conditioning, heating, domestic hot water but also any cooling need up to -60°C. The system is based on a thermal heat pump, consequently it produces more heat than the collected solar energy. Consequently a very large part of the heating needs can be provided by our system, even in geographical areas with low level of sunshine. Without CO2 impact (no release of greenhouse gas emissions), quiet, reliable and durable, suitable for small and large surfaces, the Helioclim solar air conditioning system connect with traditional chilled and hot water distribution systems. Several kind of solar thermal collectors exist : flat plate collectors, vacuum tube collectors, Fresnel concentrators, etc. Flat plate and vacuum tube collectors are not suited to reversible absorption chillers as they can’t reach sufficiently high temperature (or with a very low efficiency). 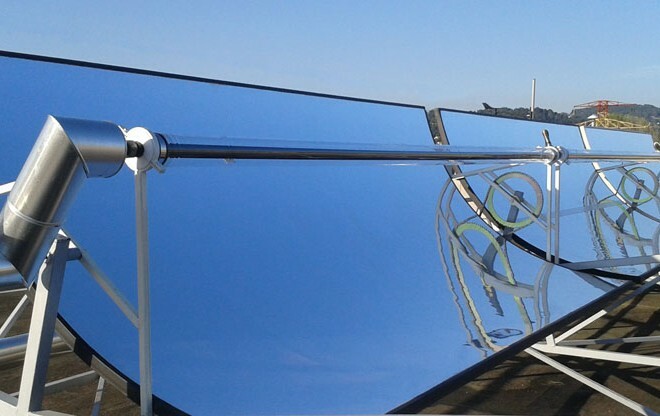 Each flat mirrors must have an individual solar tracking device, which make the system far more complex and hence create reliability and maintenance issues. Parabolic solar trough collectors can also reach very high temperature without the problem of geometry induced energy loss : they are a very well adapted solution for a reversible air conditioning system. Few other manufacturing technologies based on polished metallic sheets or polymeric reflective films are emerging, their processing being easier, but their reflectivity is much more lower and they have very low durability. As a conclusion, today, there is no solar trough technology being both adapted to reversible absorption chiller, reliable and durable, with high efficiency, and with a cost sufficiently low to make it competitive with respect to non solar systems. Based on the collectors state of the art, Helioclim has decided to develop and manufacture its own high efficiency Solar trough, designed for mass production, adapted to the coupling with an absorption chiller, and installable on building rooftops. This very innovative solar concentrators is patented. 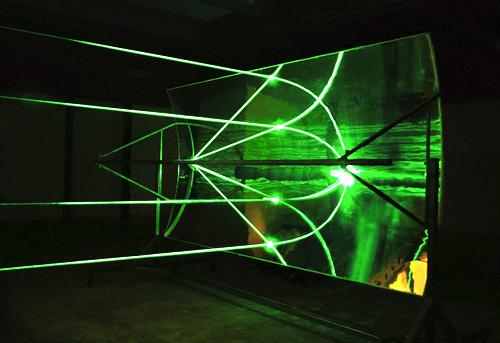 The parabolic shape of a solar trough leads to the concentration of solar beams onto the solar receiver in which circulates a heat transfer fluid. The solar troughs have to follow the course of the sun : they are equipped with a one axis sun tracking system with high accuracy. 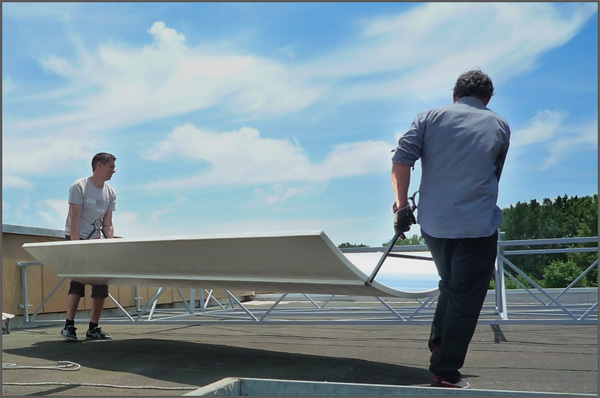 The size and the weight of Helioclim concentrators make them easily installable on building rooftops. Solar troughs concentrate solar beams on a metallic tube in which circulates a heat transfer fluid. This tube is called absorber. In order to have a good efficiency at high temperature and to be insensible to the ambient temperature, it is necessary to work with an evacuated tube solar absorber. – A metallic tube with an absorber coating having remarkable optical values (very high solar absorbance and very low thermal emissivity) and long term thermal stability. – An enclosing glass tube, with high vacuum level, giving a very high insulation level. – A glass-metal seal made through the combination of materials with matching coefficient of thermal expansion : this seal has been specially developed and intensively tested by Helioclim for this solar absorber, it can handle the temperature changes in operation and ensures vacuum stability. The absorption chiller is the part of the system which produces cold and heat at any temperature level. This is a well know and proven technology as its invention date is 1854. The absorption chiller technology has of course considerably evolved, and the Helioclim absorption chiller can for example work an energy source having a quite low temperature, typically between 150 and 200°C, while keeping very high efficiency. This chiller can consequently work with energy coming from concentrated solar source. Cooling production thanks to solar heat, how does it work? Absorption machine are frequently found in conventional cooling systems, using heat coming form gas burner to provide cooling through a well know thermodynamic cycle. 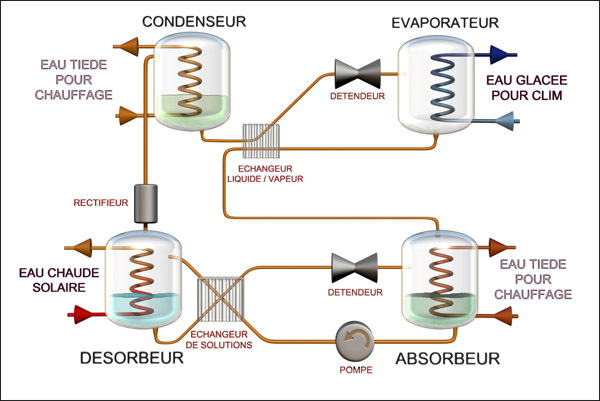 The absorption cycle is a process by which refrigeration effect is produced through the use of two fluids and some quantity of heat input, rather than electrical input as in the more familiar vapour compression cycle. Both vapour compression and absorption refrigeration cycles accomplish the removal of heat through the evaporation of a refrigerant at a low pressure and the rejection of heat through the condensation of the refrigerant at a higher pressure. The method of creating the pressure difference and circulating the refrigerant is the primary difference between the two cycles. The vapour compression cycle employs a mechanical compressor to create the pressure differences necessary to circulate the refrigerant. In the absorption system, a secondary fluid or absorbent is used to circulate the refrigerant. The absorption chiller is basically made of four entities: the condenser, evaporator, absorber and boiler. Liquid anhydrous ammonia (the refrigerant) is vaporized in the evaporator by expansion, producing cold. Vaporized ammonia is then absorbed into the absorbent solution (water with a low content of ammonia), forming a concentrated solution of refrigerant. This concentrated ammonia solution is then heated in the boiler. When its temperature increases, the refrigerant evaporates while the solution is impoverished and regenerates the absorbing fluid at low concentration. The solution is cooled in a heat exchanger and then returned to the absorption compartment. Meanwhile, the refrigerant gas at high pressure and high temperature passes through another heat exchanger, the condenser to be cooled, which is enough to make it return to the liquid state for a new cycle. The absorption chiller made by Helioclim has an unique design as it can operates with energy coming from the sun, which is a quite low temperature source (150-200°C) and that has the particularity to be intermittent and non stable. The Helioclim absorption chiller adapt its operating mode in function of the available energy thanks to a unique regulation system. The two main absorption chiller technologies are based on the fluid couples LiBr/Water and Water/Ammonia. In the LiBr/Water technology, the refrigerant is the water (in the other case it’s ammonia), which limits the cold temperature production to positive temperature. Consequently if we want to have a reversible chiller, able to produce heat during winter and reject cold outside the building even when the external temperature is negative, we have to use a Water/Ammonia system. This choice of fluid couple also allows us to operate in industrial refrigeration. Ammonia is a refrigerant particularly interesting for the future of air conditioning and refrigeration taking into account its zero impact on global warming and on the destruction of the ozone layer. In addition, the absorption chiller Water/Ammonia can operate with dry exchangers for the removal of the heat in cooling mode, and do not need the wet cooling towers or adiabatic towers required for the LiBr/Water system. These dry exchangers operate independently of humidity and allow to overcome the regulatory constraints associated with risk of spread of legionella in the atmosphere. Consequently Helioclim system can be installed in tropical areas where cooling towers can no longer function. In our solution, ammonia is confined to the chiller and does not circulate inside the buildings. The absorption chiller will be placed in a dedicated machine room separated from the building or directly outside. One of the main characteristic of solar energy, in addition to its low density, is its intermittent availability due in particular to the day and night alternation. The Helioclim system has an internal energy storage device that maintain the chiller in operation even when there is no more sunlight. The originality of the Helioclim system is that the storage is in chemical form and not thermal as in most solar systems. This solution is consequently not subject to energy loss and therefore has no time limit. Table 1 presents a comparison of volumes, temperatures and pressures required to store 100 kWh of energy (approximative required energy for the air conditioning of a 200m2 office building). The Helioclim solution enable not only to decrease the storage volume but also to reduce the temperature of liquid storage at room temperature, which lead to energy loss. Consequently energy can be stored without insulation and without time limit. During period of reduced sunlight, the system automatically switches to an auxiliary thermal energy source. This energy source can be for example gas, fuel oil or fuel-wood; It must be noticed that this auxiliary energy is not used directly to heat the building. At the opposite the auxiliary energy source replaces or completes the sun power and heat the water that goes inside the chiller, so as to take benefit of the thermal heat pump effect. The major use of this auxiliary energy source will be for heating purposes. Even in this case, the Helioclim solution remains economically and environmentally profitable : indeed, the efficiency of this thermal heat pump is superior to 160%, that is to say at last 60% of savings with respect to the direct use of this energy to heat the building (for example 1 KW of fuel gas at the entry of the absorption chiller will produce 1,6 kW of heating). Condensing boilers : maximum efficiency inferior to 110 % (based on the lower heating value). Electric heat pump: maximum efficiency inferior to 155 % (based on the lower heating value). What is the concentrators security feature in case of bad weather (hail, storm, strong wind)? Helioclim solar concentrators are installed along one line and each line has a single axis solar tracking device. Solar collectors can consequently be positioned upside down so as to preserve the mirror face and the solar absorber from the hail but also to minimize wind pressure. Why solar thermal collectors and not photovoltaic? The embodied energy related to the manufacturing of photovoltaic panels is much higher than thermal panels one and solar thermal systems are far more reliable and sustainable over time. Helioclim policy is to reduce environmental impacts related to the manufacturing of its products and to optimize aspects of maintenance ensuring maximum strength to the system. The choice of solar thermal collectors reflects this view. Is Helioclim system adapted to individual house ? At our stage of industrialization, the Helioclim solution is cost effective for power need superior to 100 kW. This solution is more adapted to large building like offices, supermarket, industries, etc.